I’m always asking you what your biggest struggles are with gardening so that I can help as much as possible. 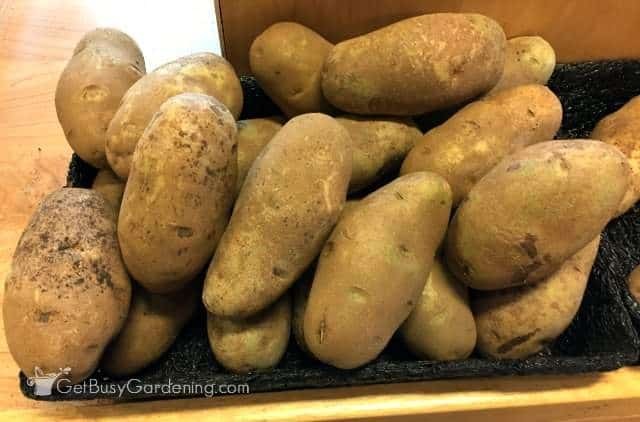 Well, it turns out that one of the most common struggles with new vegetable gardeners is knowing when to harvest their crops – and potato harvesting is one of the most common things that people ask me about. 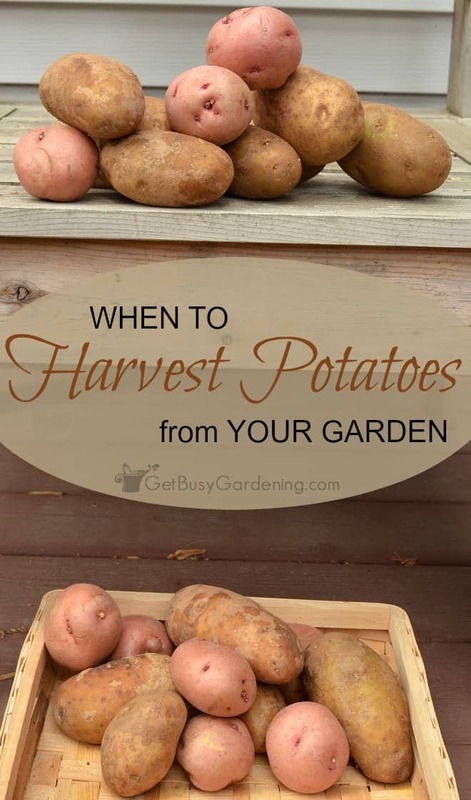 So if you’re wondering when to harvest potatoes from your garden, then this post is for you! Since potatoes grow underground, it’s not easy to know when to harvest them the first time you grow them. I know I was completely clueless about this myself the first time I grew potatoes! The good news is that it’s pretty easy to figure out when to harvest potatoes because the plant will tell you when the potatoes are ready. They’re so smart! 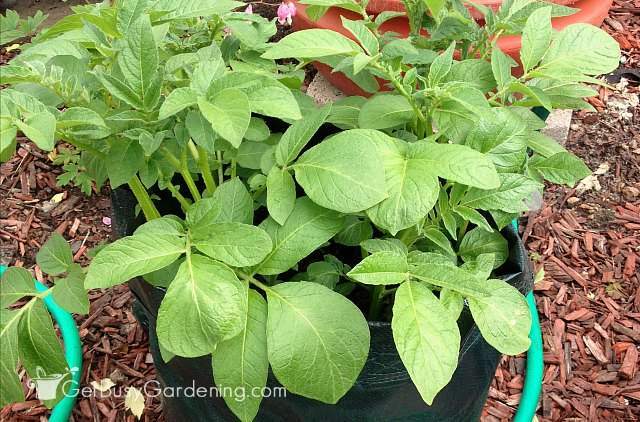 The simple answer is that potatoes are ready to harvest once the plant dies back. Potatoes are tubers that store the energy that allows the plant to grow. Once the plant starts to die back, that means all of the energy is being stored in the tubers (the potatoes), and they are getting ready to go dormant. 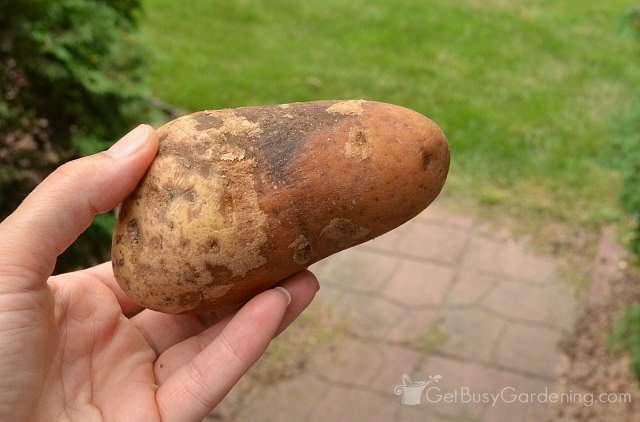 Don’t leave the potatoes in the ground too long after the plant dies back or they will start to rot. Potato harvesting usually takes place in the fall, once the daytime temperatures start to get cooler. Potatoes can take a light frost, but make sure to harvest them before it gets below freezing. 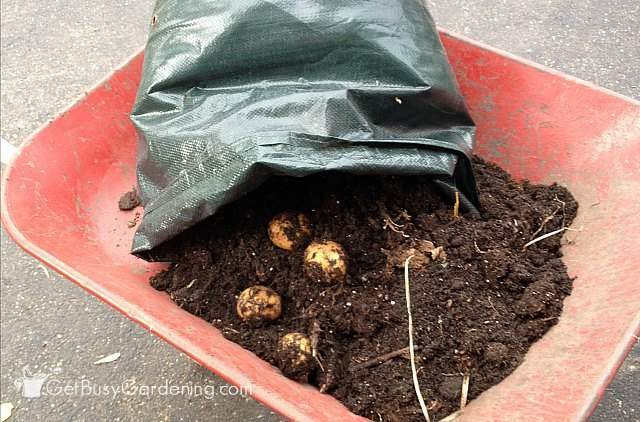 If possible, dig up your potatoes on a dry day when the soil is on the dry side. 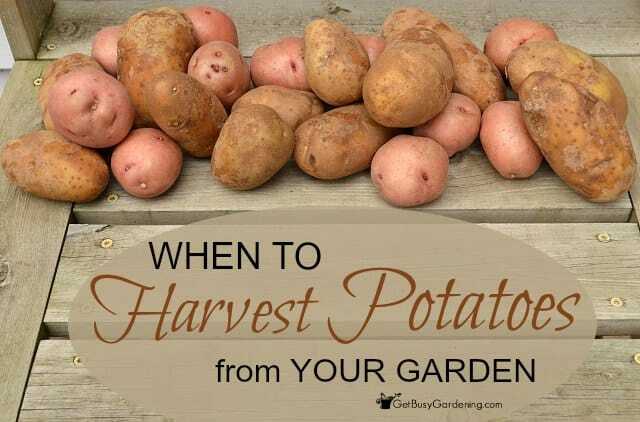 Now that you know when to harvest potatoes, I wanted to give you some tips for harvesting potatoes too. Since the potatoes are underground, it can make harvesting them a bit tricky. It’s best to start digging several inches away from the base of the plant so that you don’t damage any of the potatoes. 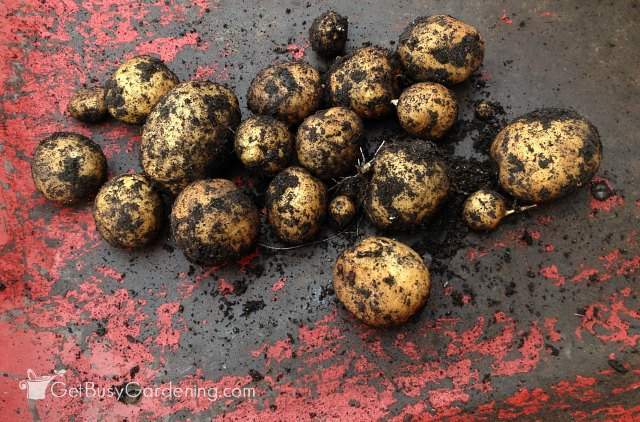 Be sure to carefully dig down all the way under the clump of potatoes to loosen up the soil. I find it easier to dig in the soil with my hands once it’s loosened up a bit so that I don’t cut or chop a bunch of potatoes in half as I’m digging with the shovel. Be gentle with the potatoes as you harvest them. Don’t carelessly drop them into a bucket or toss them into a pile. Damaged and bruised potatoes won’t store well. Also, too much light will make potatoes turn green, so don’t allow them to sit in the sun for too long after you harvest them. Inspect each potato for signs of rot or other damage after you’re done harvesting them. If you cut or puncture any of the potatoes as you’re digging, that’s ok. They are still edible! Just eat those up first and don’t try to store them. If you plan on storing your potatoes, don’t wash them after you harvest them. Simply brush off any large clumps of dirt with your hands, taking care not to damage or peel off parts of the skin in the process. You don’t need to be fussy about this and get all the dirt off though, just any large clumps. Just like onions, potatoes must be cured (dried out) before you can store them. 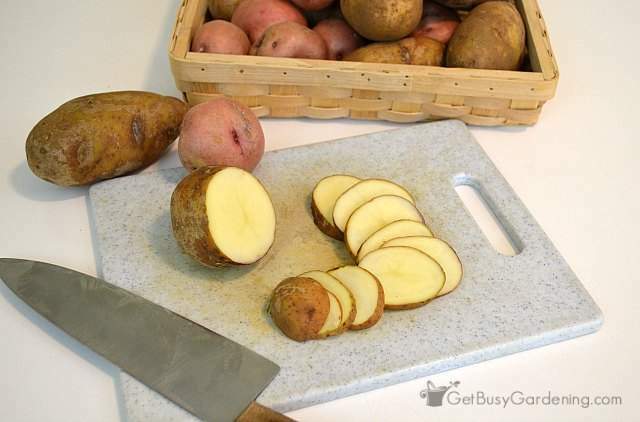 Allow your potatoes to sit in the garage or dry basement for a few weeks to dry out completely before storing them. Store potatoes in a cool, dry and dark place. 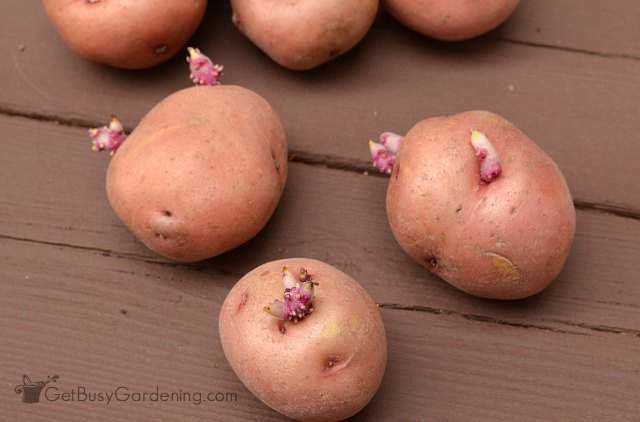 If any of your potatoes in storage start to sprout, use those first (or save them and plant them in your garden in the spring!). Warm temperatures will cause the potatoes to sprout faster, and if it’s too damp the potatoes will only rot. A dark pantry or root cellar are perfect choices (I sure wish I had a root cellar!). If you choose the right location, potatoes will last for several months in storage and you can enjoy garden fresh potatoes all winter long. Yum!! Do you have anything to add to help other gardeners figure out when to harvest potatoes from the garden, or any tips for harvesting potatoes? Please share them in the comments below. Thank you for this potato advice. I grew my own potatoes by accident. Haha, that’s hilarious! I’ve grown potatoes in my compost bin on accident after tossing in some rotted ones before. Love those volunteer veggies!! Great post. I pinning because in spring I would like to plant for potatoes. Easy enough and so much better for me. Thank you for sharing and I would love if you would share this post at a link party I am co-hosting. I hope to see you there. Have a great day. Thanks for stopping by! Good luck with your potatoes next year, I hope they will grow well for you! Very interesting post! Great info here.Thanks for linking up to Merry Monday! Pinned! Have a great week! Thanks for the info–we just harvested about 50 lbs–our first crop of potatoes. They are in buckets right now, I would have washed them without your information. So glad you linked up to the Talk of the Town party! I love growing potatoes. I usually do it every year. They are such a simple and nutritious starter plant for beginner gardeners. We just planted our first crop of sweet potatoes. They have been in the ground for a month now and have started sending out runners. Should we trim the runners off or keep the runners on and allow them to grow? Thanks for the info, I just planted two sprouts a mo. ago and needed too know how long it takes before harvest time .